Located in the historical center of Évora, this comfortable hotel is the starting point for getting to know the UNESCO World Heritage city and the entire Alentejo plain. Resisting the time, the wall that seems to prove the existence of the first bullring of Évora, led to the first Évora establishment. Standing the test of time, the wall with construction features that seem to prove the existence of the first Bullring of Évora gave way to the facade of this hotel. 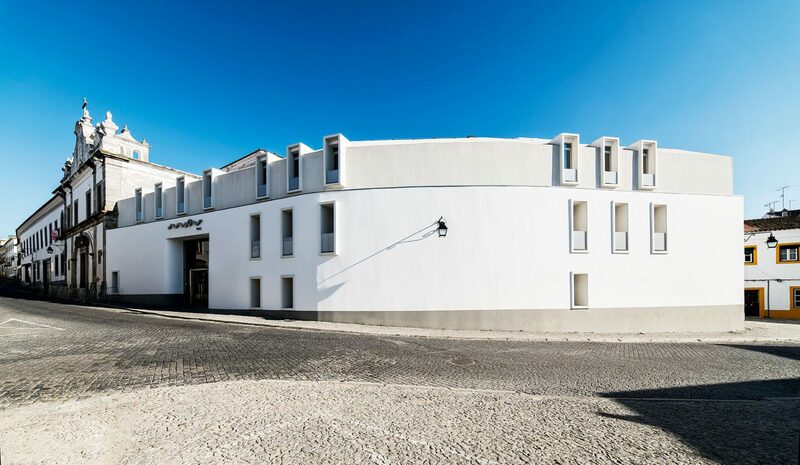 Near the main accesses of the city, built next to the Mercês church, by Raimundo street and in the historic centre classified as a UNESCO World Heritage Site, Moov Hotel Évora is endowed with a unique location in the historical centre at a walking distance from the emblematic Giraldo Square. 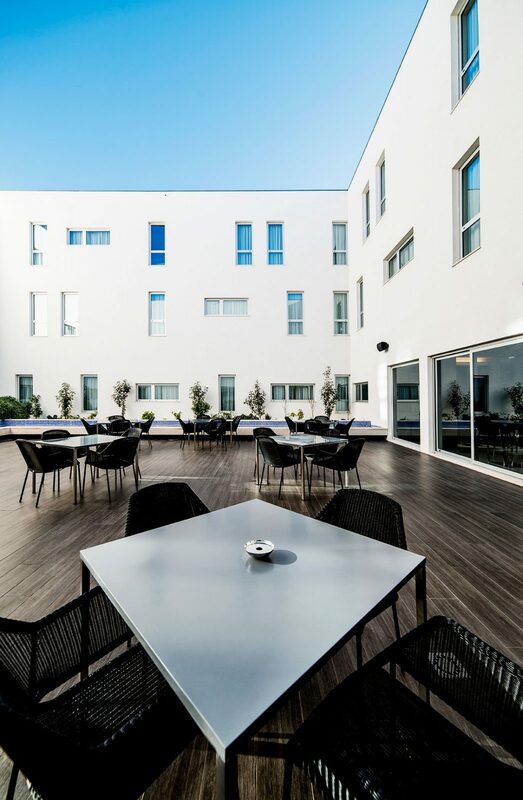 And if you are anxious to discover the fascinating Plains of Alentejo and the megalithic archaeological landscape, the Moov Hotel Évora is a good starting point for your adventure. The entire building has been built around a courtyard, and most rooms look into said courtyard. This courtyard has a fountain surrounded by garden which makes this the ideal space for leisure and wellbeing. 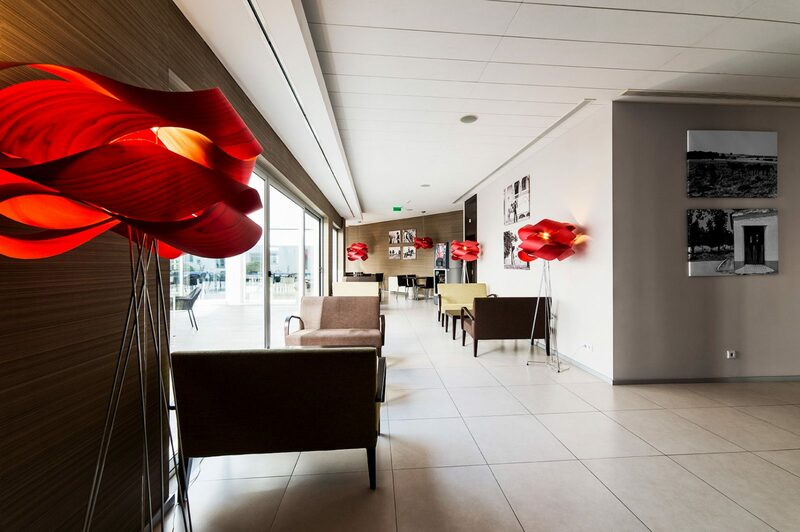 With an area of 3100m2, the hotel features 3 floors with a total of 80 rooms. 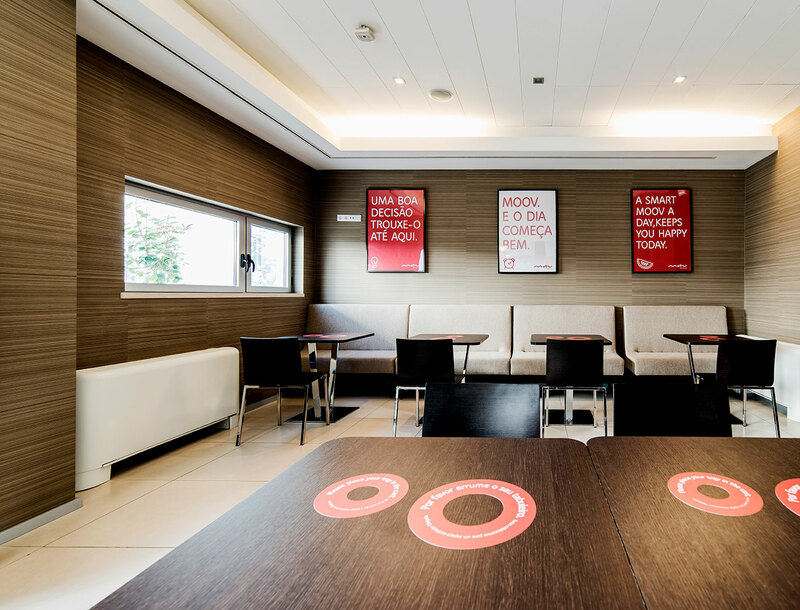 Moov Hotel Évora is a 4-minute drive from Évora train station with direct connection to Lisbon. Discover the heart of the Alentejo and take the opportunity to visit the Portuguese capital, a journey which lasts approximately 1 hour. Know our services and make the best option, whether you are on business or pure leisure. For an affordable value, enjoy a delicious breakfast. Price: 8.50€ per adult per day / 2.80€ per child (7 -12 years) per day. All our hotels have private parking. Price: for only 8€ per day you can use our parking. Be always connected, throughout the hotel, at no cost. Ensuring your comfort with clean spaces and care is one of our priorities. 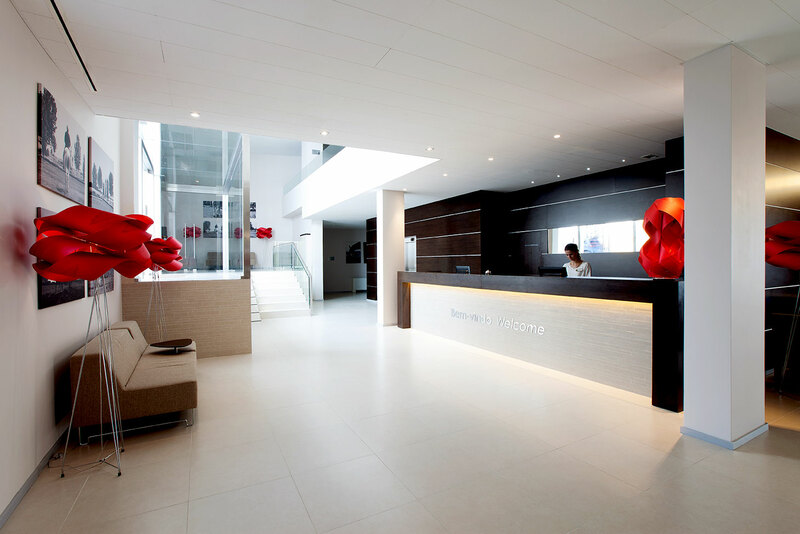 The reception operates 24/7, always at your disposal, for all your needs. We rely on efficient equipment, sensors, ecological showers and LED lamps. 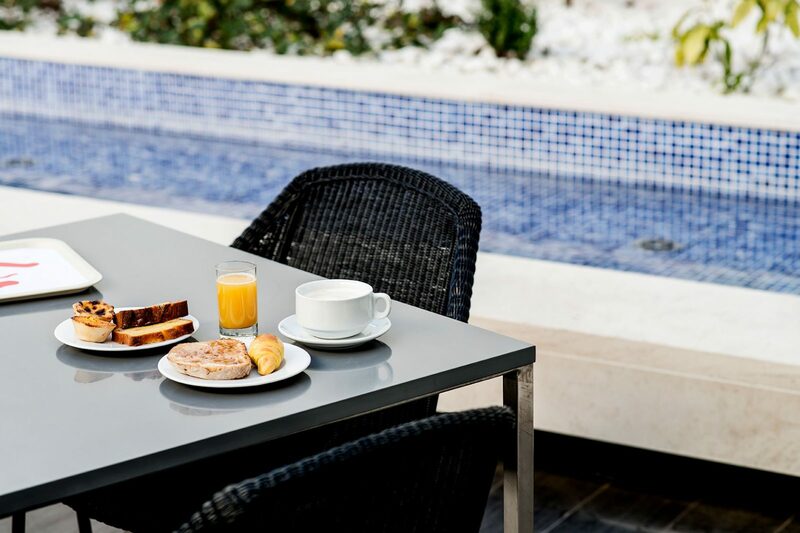 We have a patio with garden where you can have breakfast outdoor in a cozy atmosphere. Located at the reception, on request. Air-conditioned and soundproofed room with minimalist décor and 2 single beds pushed together. Air-conditioned room with minimalist décor, soundproofing and 2 double beds. With a minimalist décor, this air-conditioned and soundproofed room features a single or double bed. This room is specially adapted for disabled guests. Air-conditioned room with a minimalist décor, soundproofing and a double bed. * Our rooms do not have cots or extra beds. Children under 12 years old can share the bed, with parents with no extra costs. Subscribe our newsletter and do not miss our offers!